Pop Culture Safari! 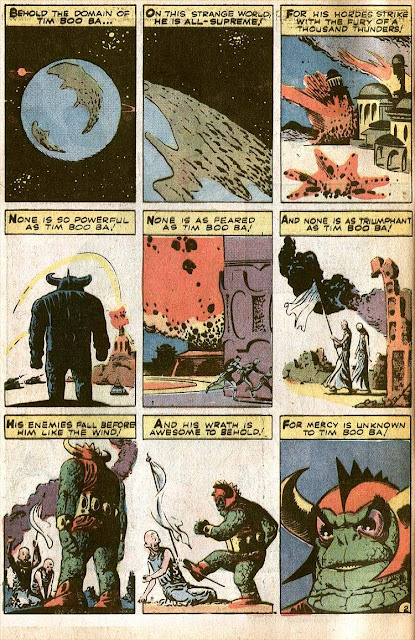 : "The Threat of Tim Boo Ba" or "How Steve Ditko introduced me to Marvel Comics (and Irony)"
"The Threat of Tim Boo Ba" or "How Steve Ditko introduced me to Marvel Comics (and Irony)"
What was my first comic book? I couldn't really tell you. There's a coverless early 1970s issue of Batman or Detective Comics in my collection, likely picked up at a garage sale. I was a big Batman fan, thanks to reruns of the show. 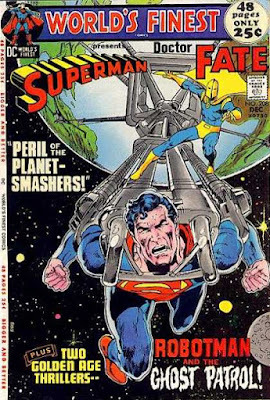 I think the first comic I (or, rather, my parents) bought off the newsstand is World's Finest #208, which came out in October 1971, when I was 5 years old. 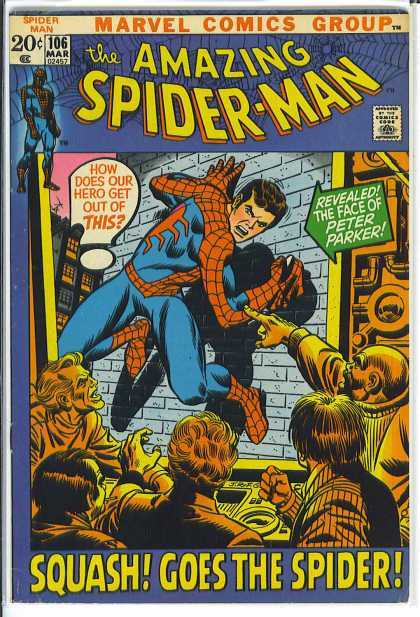 My first Marvel comic was probably Amazing Spider-Man #106, which hit the spinner rack a couple of months later. 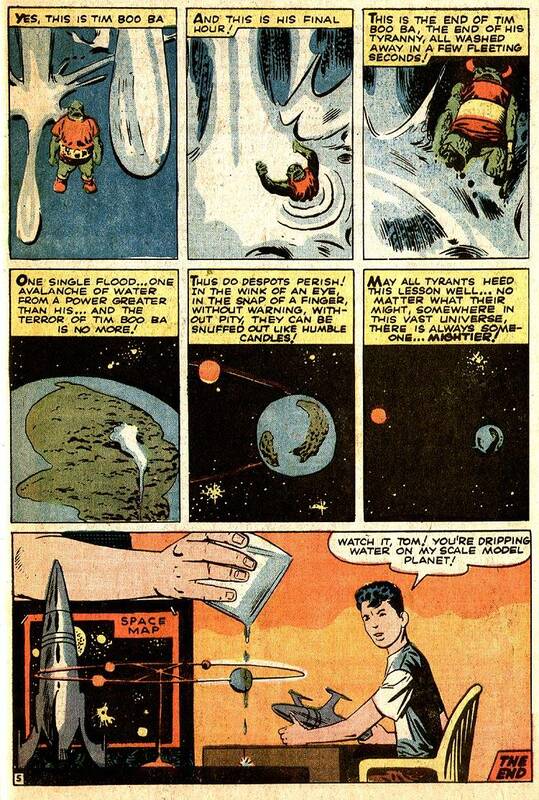 But, apart from that Spidey book, my primary interest was in DC, and that's what I read for the most part. Lots of Batman, Superman and Justice League. I only became aware of Marvel as a unique entity when a comics-reading big brother of a friend down the street started talking about how cool Marvel was. 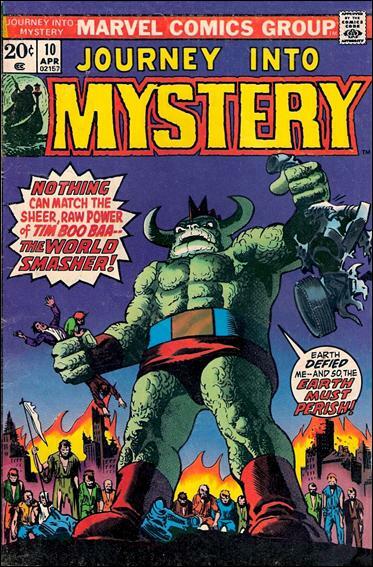 And he ended up giving me a copy of a mag he probably didn't think too much of at the height of the Bronze Age, but which made a huge impression on me: namely Journey Into Mystery #10, which came out in January 1974, and was probably pretty new when I received it. 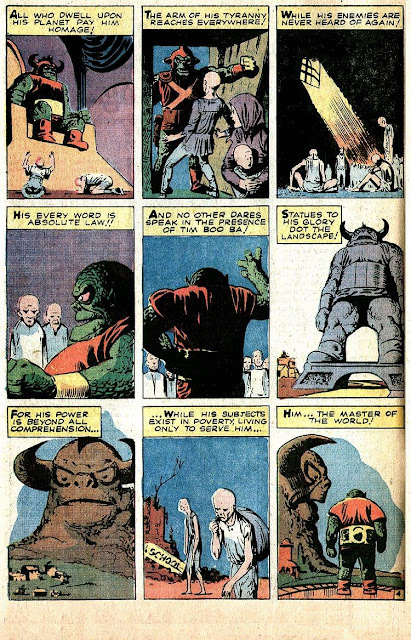 Journey into Mystery reprinted the monster and suspense stories created by Stan Lee, Jack Kirby, Steve Ditko and others before Marvel got into the superhero biz with the Fantastic Four. I still have the comic in my collection and haven't looked at it in years. The only story I remember from it, and the one I'll likely never forget, is "The Threat of Tim Boo Ba," which introduced me not only to Ditko's art, but to the concept of irony. Many of these tales were in the O. Henry-by-way-of-"The Twilight Zone" mold, specializing in trick endings. And this tale had the coolest. As not to spoil it, I've shared the story below. 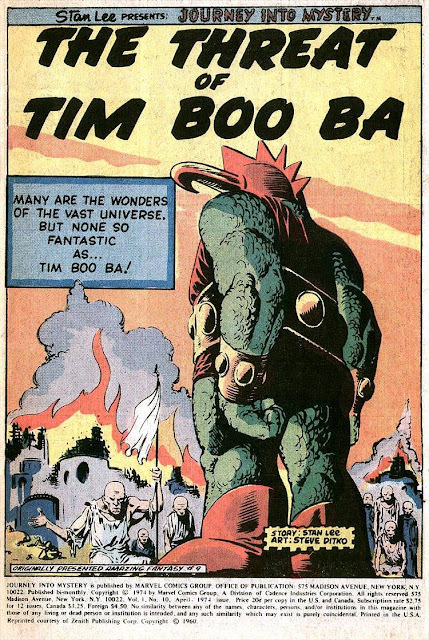 The story was originally published in 1962, under the title "The Terror of Tim Boo Ba," in Amazing Fantasy #9.Maybe they changed the title due to Comics Code restrictions. I don't know. Anyway, whenever I think of Ditko, as I have been a lot over the past week since his death, I recall this story - just one examples of the many memorable moments Ditko was responsible for among comics readers worldwide. It's not the best story Ditko ever did, but the first one I read. 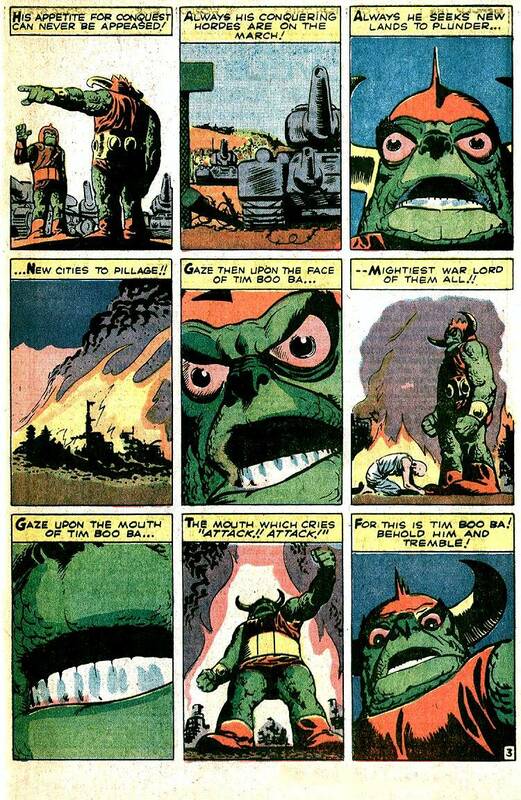 And everyone's first story by Lee, Kirby or Ditko is special.